In this section we will look at some types of virtualization software, how they work and the difference between them. I will only look at the most popular types of software used for virtualization. There are so many different types that it would be impractical to list them all here and to discuss each. Listed below are some of the more popular offerings in the market. Probably the most well known vendor of virtualization software. VMware has been in the market for a long time and has a lot of products from desktop to server virtualization. Their products include full virtualization, which could be virtualization software you install on a existing operating system or a bare metal installation using ESX or ESXi. It does not stop there, they also have software for fail over of virtual machine called vMotion. VMware Workstation - Classic example of desktop virtualization software. Install this software on an existing machine and run multiple VM's in your environment. This is a licensed product but you can use it free for a period of time, usually 30days. VMware Player - If you want to get started immediately with creating virtual machines, then this is the software to get. You can download it for free and create virtual machines and play existing VM environments. It's not as complete as the workstation edition, but you will get a good idea of virtualization with this product. 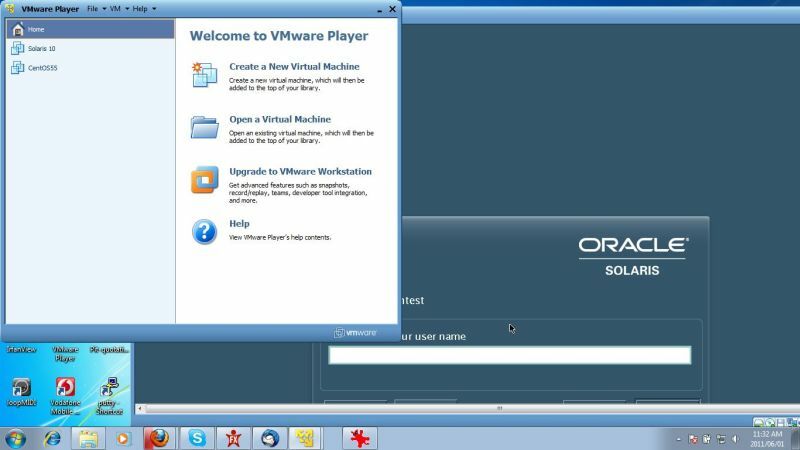 Below is a screenshot of the VMware player with Solaris 10 installed in a VM and running. VMware Fusion - Virtualization software for MAC. There is also Zimbra, VMware View, VMware ThinApp, VMware ACE, VMware MVP. VMware vSphere - Is the flagship product from VMware. vSphere comes in different kits depending on the business needs of the company. Some of these kits include products like vMotion if you want to migrate from one server to another. VMware vSphere comes in different flavors such as ESX, ESXi installable and ESXi embedded. ESX is a bare metal meaning it installs directly on the host. It also includes a console for access. The ESX product is going to be replaced by the ESXi software. ESXi has two versions. ESXi installable and ESXi embedded. ESXi installable is like ESX meaning it can be installed on the bare metal. You get the software on DVD and install it directly on the hardware with the need to install some operating system first. ESXi embedded, is embedded in the firmware of the server. It usually comes in a flash drive that has the software already on it. You just need to point the BIOS to the flash drive and it boots the ESXi from it. This makes for faster deployments. So how do you control all this software and hosts? You use the vCenter Server manager software. This is usually installed on a separate system, or virtual machine. 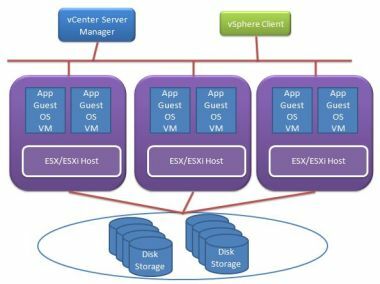 vCenter controls and monitors the actions that happens on the ESX/ESXi host systems. The front end to vCenter is a client that you download and install on yet another system. This could be your laptop or smaller system. You then connect from the client software to vCenter that manages your ESX/ESXi hosts. The ESX/ESXi hosts are the actual servers where you run your virtual machines from. As you can see, VMware's setup is quite complicated so not anyone can just download and install it. Well, you can, but just for playing and evaluation purposes. I would not even try it to do an installation without the needed training. VMware has extensive training and certification paths. You can this information on their website. They also have a whole range of software for cloud computing. Please visit VMware website (Opens in new window) for more details on their products. Oracle renamed a lot of the Sun Microsystems software after they bought Sun. Let's start with the desktop products. 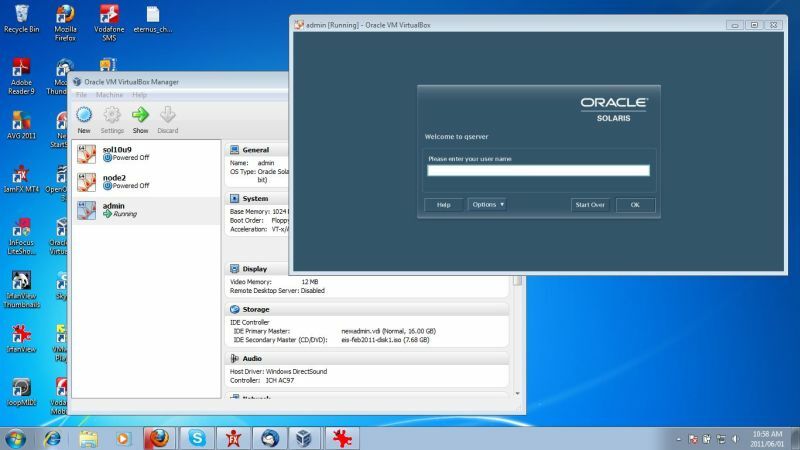 Oracle VM VirtualBox is an excellent and free virtualization software from Oracle. It let's you create virtual machines on Windows, Linux, Mac and Solaris. Installation is a breeze and creating your first VM is only a couple of clicks away. I really like this software for it's ease of use. Oracle also regularly update VirtualBox. Whenever you start VirtualBox, the software checks if there is a new version and asks you if you want to upgrade. Below is a picture of the VirtualBox manager. Get the virtualization software here (Opens in new window) and install it. I have also created step by step instructions on how to get this software going. See my VirtualBox install page for more details. 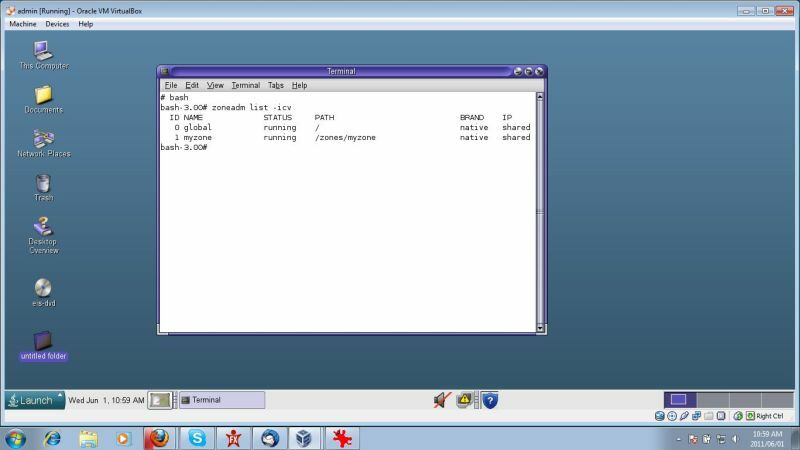 Below is a screenshot of Solaris 10 running in a VirtualBox. 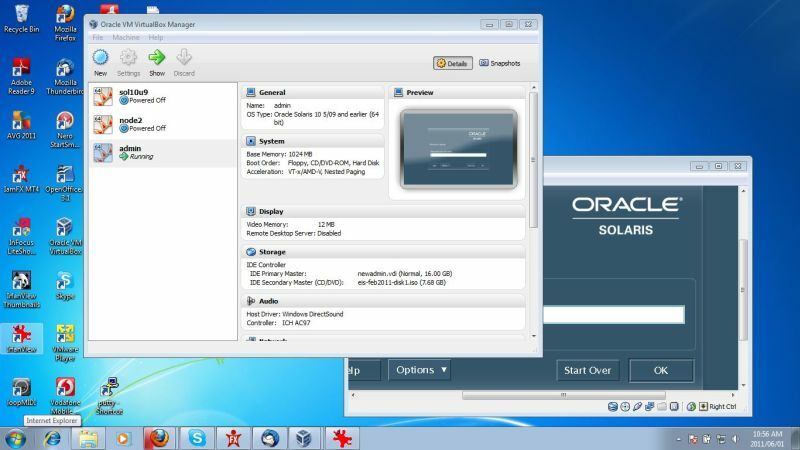 I have actually created 3 virtual machines with Solaris 10 installed and 2 of the Solaris 10 VM's are clustered. I used Solaris Cluster 3.2 and I clustered Oracle 10g for Solaris x86. The third VM is my quorum server. So think about this for a moment. I have 3 VM's, 2 are clustered and Oracle 10g installed with a quorum server. All of this on a laptop, not a desktop, a laptop. Makes you think, doesn't it. Oracle VDI or Virtual Desktop Infrastructure is virtualization software that you can use to create virtual machines and then use it on devices called zero client hardware. This zero client hardware is called Sun Ray Clients. Below is a diagram. 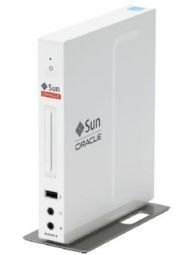 Since Oracle has bought Sun, they can supply a complete solution from software to the hardware. With the Sun ray, you create your virtual machine on a server and install the VDI software on the same or different server. You connect your Sun Ray to the network, specify some parameters on the VDI server regarding the client and power the client on. That's it!. Your VM will be displayed on the Sun Ray Client system. No actual data is transferred to the Sun Ray. Only raster data or screen data is sent to the client. This makes it very efficient and secure cause no data is actually stored on the client like thin clients. With thin clients, some data is actually downloaded to the thin client device to make it work. With zero clients, no actual data needs to be transferred in order for it to work. This is very cool. Lot's of other companies are now also jumping on the zero client bandwagon such as Pano Logic and Fujitsu. Oracle VM server for x86 is a product that is based on the XEN project. You install the VM software on the server and the hypervisor is already included. This is similar to VMware ESXi. This type of installation is called a bare metal hypervisor installation. After you install Oracle VM for x86, you can start to create virtual machines without the need to install additional software. Oracle VM server for SPARC is very similar, in concept, to zones. The difference is that each domain you install has it's own kernel and Open Boot Prom (OBP). The hypevisor also runs as a thin layer just above the hardware. Sun used to call it logical domains or ldoms. With Oracle VM for SPARC, you actually assign virtual cpu's or threads to the individual domains. The same goes for memory. IO is very flexible and can be assigned by means of whole disks, filesystems and iso's, to name a few. These ldoms can only be done on the T-Series systems such as the T5120, T5240, T3 and so forth. These systems makes use of the coolthreads processors. The latest T3 coolthreads cpu contains 16 cores and 16 threads per core. That gives you 128 virtual cpu's per socket! Now, if that's not cool, then I don't know what is. Solaris zones or containers is a technology that Sun introduced with their Solaris 10 operating system. Some call this kind of virtualization, operating system virtualization. It's very simple. You install the Solaris 10 operating system on either x86 or SPARC. After that you login, create the zones and install the Solaris OS on the zones you created. This is not a stock standard Solaris install, you actually just copy the current OS into the zone. You can either do whole root zones, or partial root zones. Whole root zones creates a full installation like a normal Solaris install would do. Partial will only create a small root. The rest will be referenced via loopback links or filesystems to the global zone. With Solaris zones, you have the global zones by default. When you display your zones, you will always see the global zone. You can now create your zones and configure them. XEN is free virtualization software under the GNU General Public License. Like I said earlier, Oracle VM is actually based on XEN. XEN is whats known as a bare metal virtual machine manager or hypervisor. You install the software and then you can create your virtual machines and run several different operating systems concurrently. You can also run VM in para-virtualization mode. You cannot run just any OS in para-virtualization mode. You must use an OS that has been modified especially for para-virtual mode. It's a kernel thing. Some OS's can run in para-virtualization mode. Just check on the XEN site and also on the OS you want to use. Ubuntu Linux, for instance, can be run in para-virtualization mode. I have only touched on the most common virtualization products out there. There are lots more. Microsoft, for instance, has their own virtualization software called HyperV. Just about every company out there that makes an operating system has some form of virtualization built in. If you want to just play with it then use one of the desktop products I mentioned on this page. It's easy to use and most of it is completely free. What is in my computer? Discover what goes into a PC?